Knowing my love for Liberty fabrics, my daughter brought me this cute suitcase from Paris, although I believe the origin is English... My precious fabrics found their place inside. Talking about suitcase, it's time for me to prepare my suitcases and get ready for my moving to France for the summer. Because of too much work in the house, since I finished those two quilts that you can see with the suitcase, I did not sew a lot, just slowly progressing my hexagon cushion that I would like to finish to take it with me. There is so much to do before leaving that sometimes I feel it's insurmountable! This week I tried to do some gardening. I wish I would be good in this, but unfortunately I am rather a plant killer although tremendous efforts! That's why I find those succulents miraculous, they are the only ones to resist to my inability! They seem very strong and reproduce themselves easily. I have found in my daughter's garden a different kind of succulent than the ones I have and I try to have them grow roots in water before planting them. I wonder if I could put those cuttings straight in the earth without any root... would they grow?? Progressing in the garden I took some pictures that I will post next time. Oh what a gorgeous suitcase, and a real treasure trove inside! What a lovely suitcase. Its perfect for liberty fabrics. 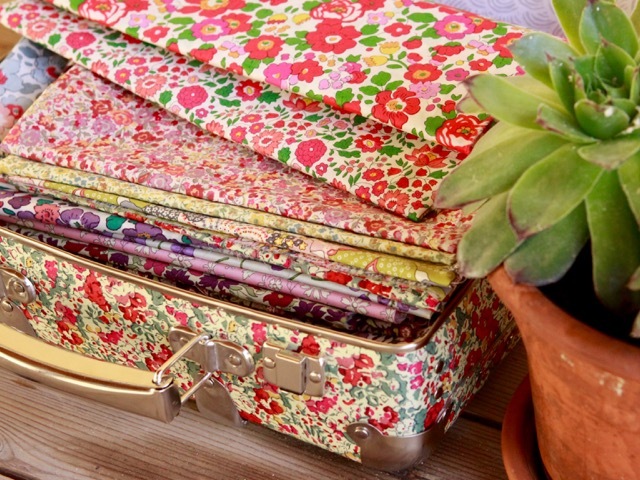 Love Liberty fabrics and that suitcase... *swoon*... is gorgeous! Is Liberty fabric way more expensive in Europe (compared to other fabrics)? I have never seen it in Canada but in the US I see some of the on-line shops are selling it for $32- $49 a yard! Ouch! But so pretty!! What a treasure....inside and out! 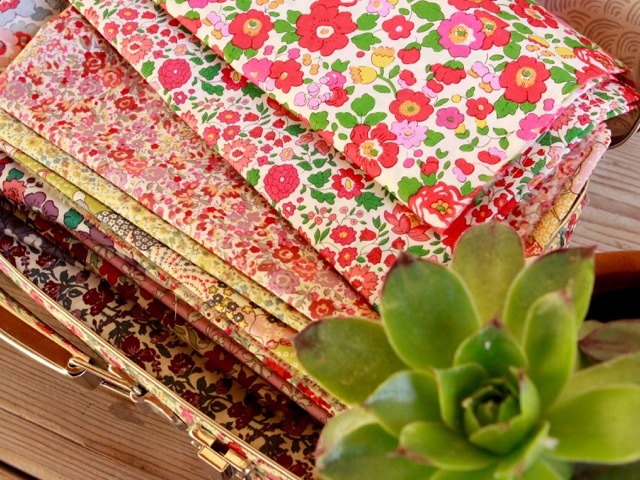 I think your pretty Liberty fabrics and quilts more than make up for your gardening! 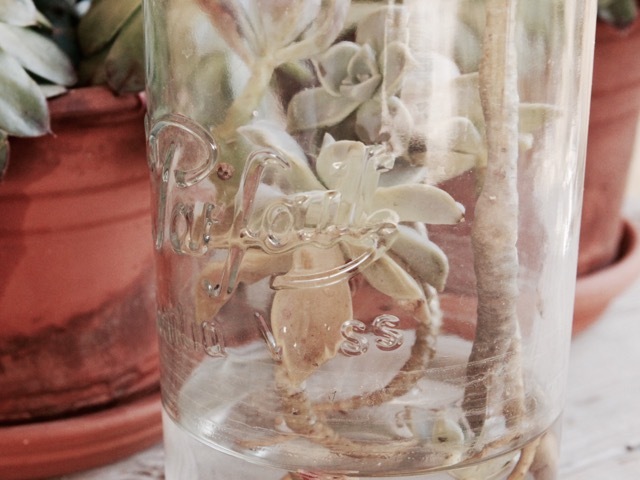 Yes, you can place your succulent cuttings in the soil without roots. If the soil is moist (not soggy), roots will form along the stems. Just be sure not to over water. Lovely fabric, too. I remember my mother looking at Liberty Fabrics and that was over 40 years ago! 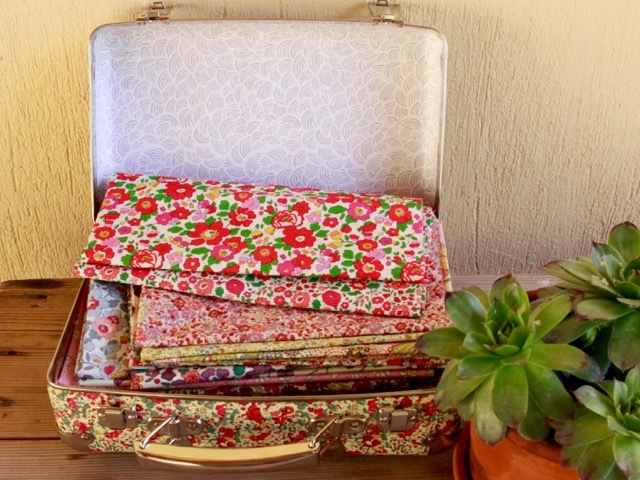 The flower fabrics and liberty suitcase are wonderful ! Your daughter is so thoughtful to send the Liberty suitcase to you! Best wishes preparing the house and garden for your summer away. It does sound like a very large task. 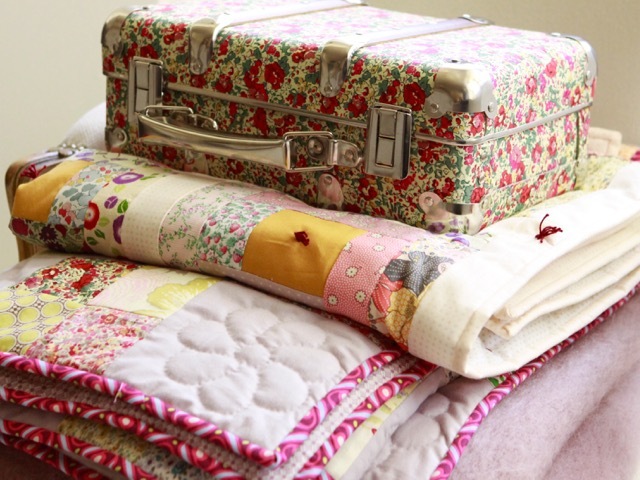 What a sweet gift from your daughter and the perfect home for your Liberty fabrics. 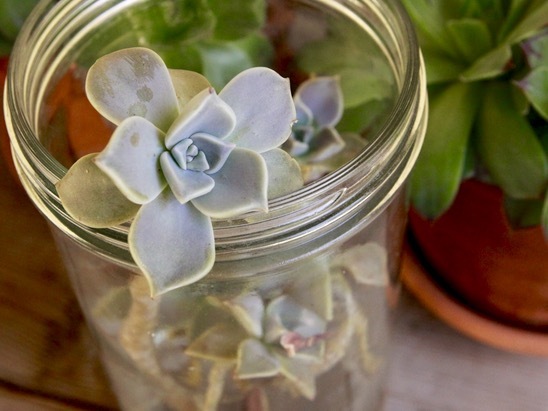 As long as the ground has a little moisture, your succulents should be able to root themselves and grow, Just bury those long stems and roots will spring up along their length. I wish you safe and comfortable journeys Christine! Such a wonderful gift from your daughter! A lovely storage space for your lovely fabrics! It is always so much work to prepare for a trip. I hope you have a wonderful Summer in Paris! Tu peux les planter dans la terre without racines, ils pousseront ! J'en ai fait l'expérience mais j'ai remarqué qu'ils étaient plus beaux à l'ombre qu'au soleil ! Ils m'ont pourtant l'air d'une plante grasse .....le mystère de la nature ....! Ta Liberty valise est très belle ! Quel beau cadeau ! What a treasure that suitcase is, with all the beautiful fabric inside! And so cute, too. Don't forget, summer is for relaxing! That suitcase is so lovely! I wish that I could fit in your suitcase and go to France for the summer! 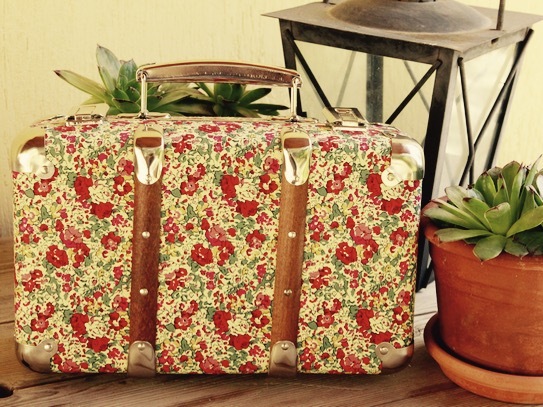 Your suitcase is darling--especially with your Liberty fabrics in it. I always enjoy your lovely photo shoots. Love the suitcase! Gorgeous! Looks like your girl knows what Momma loves! You brought your daughter up right - the best gift ever! Moving to France for the summer??!! Can I come?! I'm pretty little, could maybe scrunch up in one of your suitcases, lol. I've loved France and all things French since I was a little girl; my mum says, and I agree with her, that I was French in my last life, my last several lives! I, too, adore Liberty of London fabric, ever since I took a class in how to make kaleidoscope quilts in Paula Nadelstern style, from a protégée of hers. Sadly, I have none, need to remedy that one of these days! Bonnes vacances!